Référence bibliographique : M. Dinter, C. Guérin, M. Martinho (dir. ), Reading Roman Declamation - Calpurnius Flaccus, 2017. As a genre situated at the crossroad of rhetoric and fiction declamatio offers the freedom to experiment with new forms of discourse. Placing the literariness of declamatio into the spotlight, this volume showcases declamation as a realm of genuine literary creation with its own theoretical underpinning, literary technique and generic conventions. Focusing on the oeuvre of Calpurnius Flaccus this volume demonstrates that these texts constitute a genre on their own, the rhetorical and literary framework of which remains not yet fully mapped. Contributions from an international group of leading scholars from the field of Roman Literature and Rhetoric will explore the question of how Roman Declamation functions as a literary genre. 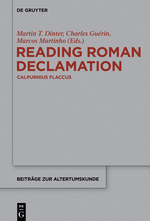 This volume investigates the literary technique and the generic conventions of declamatio in its social, pedagocial and ethical context to determine “the poetics” of Roman Declamation. This volume is of interest to students and scholars of Rhetoric and Roman Literature. Martin T. Dinter and Charles Guérin – Introduction: Calpurnius – a postmodern author?